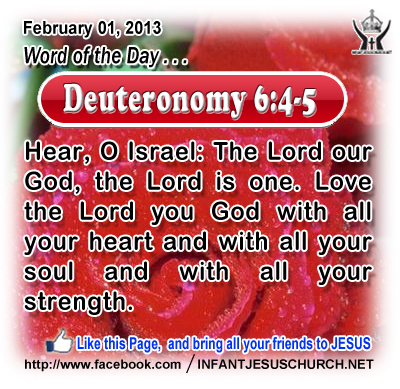 Deuteronomy 6:4-5: Hear, O Israel: The Lord our God, the Lord is one. Love the Lord you God with all your heart and with all your soul and with all your strength. Heavenly Father, we honor you as God Almighty. We appreciate you for all your kindness and blessings lavished upon us. We love you because you first loved us in Jesus. My heart's desire today is to demonstrate our love for you in all we do, and love and say. Through Jesus. Amen. 26And he said, "The kingdom of God is as if a man should scatter seed upon the ground, 27and should sleep and rise night and day, and the seed should sprout and grow, he knows not how. 27The earth produces of itself, first the blade, then the ear, then the full grain in the ear. 28But when the grain is ripe, at once he puts in the sickle, because the harvest has come." 29And he said, "With what can we compare the kingdom of God, or what parable shall we use for it? 31It is like a grain of mustard seed, which, when sown upon the ground, is the smallest of all the seeds on earth; 32yet when it is sown it grows up and becomes the greatest of all shrubs, and puts forth large branches, so that the birds of the air can make nests in its shade." 33With many such parables he spoke the word to them, as they were able to hear it; 34he did not speak to them without a parable, but privately to his own disciples he explained everything. The Lord of the Universe is ever ready to change us by the power of his Spirit. Are we ready to let God change us by his grace and power? The kingdom of God produces a change in those who receive the new life which Jesus Christ offers. When we yield to Jesus Christ, our lives are transformed by the power of the Holy Spirit who stays in us. Paul the Apostle says, “we have this treasure in earthen vessels, to show that the inspiring power belongs to God and not to us". Do we believe in the transforming power of the Holy Spirit? Loving Infant Jesus, fill us with your Holy Spirit and transform us into the Jesus-like holiness you desire. Increase our zeal for your kingdom and instill in us a holy desire to live for your greater glory.